Let’s go over step by step on how to draw that cute orange fish we’ve all grown to love. To start, let’s grab the Ellipse tool and draw a perfect, orange circle. With the circle selected, head up to Path > Object to Path so we can adjust the nodes. Use the Nodes tool to fine tune the shape to what I have below. Now, let’s draw another perfect circle and color it white as we’ll be drawing the eyes with this. Continue to draw another black circle, along with another white circle. Position them accordingly to get that signature cartoon eye. Once you’ve finished one eye, go ahead and Object > Group, then duplicate it for the second eye. You can also use Object > Align and Distribute to align everything. For the mouth, let’s just use the Pen tool and draw a simple line with a 2px Stroke. Then we can use the Nodes tool to curve that line into a cute smile. To finish it up, let’s put two round lines on each end of the smile. While we’re at it, let’s use this same line style to draw a couple eyebrows. To start drawing fins, we’re going to use the Pen tool to draw a shape similar to the one below. Now we can use the Nodes tool and round out those corners. When your fin is perfect, go ahead and give it a slightly darker orange color and set it behind the head. And of course, we need to duplicate this fin, flip it horizontally, and shrink it down a bit. Now we need to embark on the unfortunate task of chopping up Nemo’s poor little fin. To start, just draw a triangle over the area we’re going to cut. With both the triangle and the fin selected, head up to Path > Difference to make the incision. Now you can do some finishing touches by rounding some of the edges. To start drawing the top fin, let’s grab the Pen tool and draw a slanted rectangle. Of course, we’ll need to smooth things out a bit again. And let’s give it that same color orange we started with. We’re also going to want to add an addition to the top fin. And, yes, let’s round yet another object. Finally, make it a slightly darker orange and place it behind the first part of the fin. To create some shading, let’s duplicate the original head object. Next, you’ll want to position one over the other and stretch it out a bit. With both of those shapes selected, head up to Path > Difference. You’ll end up with a nice cutout shape like I have below. Go ahead and put this shading shape into position. Align and Distribute will be your best friend for keeping your shading shapes aligned. Repeat this process to get the desired shading for your fins also. Don’t forget his tiny fin! I also added some black tips on his fins by using the same Path > Difference method for each fin. Finally, all that’s left to do is create some sort of background to finish it up! He’s so darn cute, I can’t stand it. This was such a fun drawing to do because it’s so simple and adorable. 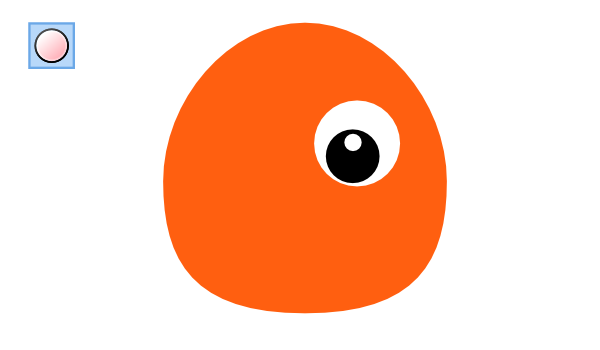 We went over basic Inkscape functions and shapes to create a cartoon version of Nemo, and it turned out pretty well. Thanks for reading!